Pianist Andrew Rangell with Emmanuel Music Friday in Rockport. ROCKPORT — In addition to importing high-caliber groups and performers, Rockport Music has smartly forged relationships with a number of important Boston ensembles. Case in point: Emmanuel Music, which the Rockport Chamber Music Festival brought to the Shalin Liu Performance Center on Friday for a program of works by Bach and Handel. It sounded like an ideal matchup of performers and repertoire, but the results were inconsistent. 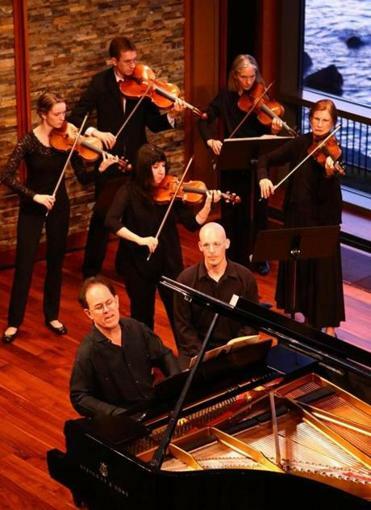 The concert began with Bach’s First French Suite in the hands of Andrew Rangell, a pianist whose appearances have grown sporadic in recent years because of his struggles with dystonia. He brought to the suite an eclectic mix of qualities: a liberally pedaled sound, abrupt changes in dynamics and articulation, and such malleable tempos that any sense of a consistent pulse was often lost. There were moments of mystery and beauty in the Sarabande, but elsewhere Rangell’s pianism seemed puzzlingly blunt and inelegant, losing any sense of Bach’s dance rhythms. He fared better in Bach’s D-minor concerto, working in close accord with Emmanuel’s strings and music director Ryan Turner. The weight of Rangell’s piano sound created a perfect foil for the light string sound, and the slow movement created a wonderfully dark, lonely aura. Still, I wish Rangell could’ve played more softly, to let the lower strings emerge more clearly. And in the finale he sometimes banged the keyboard so fiercely that the sound verged on sheer, clangorous noise. After intermission came Handel’s secular cantata “Apollo e Dafne,” in which a god who conquers the earth is brought low by his love for a maiden he cannot attain, and who metamorphoses into a tree at the end. This obscure — or at least underperformed — gem was sung by two Emmanuel veterans. Baritone Dana Whiteside was the swaggering, overconfident Apollo, and soprano Susan Consoli the alternately innocent and defiant Dafne. There were plenty of vocal fireworks, and the pair was particularly adept at navigating the acrobatics of the duet “Una guerra ho dentro il seno” (“A war rages in my breast”). Consoli’s pitch was at times approximate, and by the end Whiteside, who has one of the most powerful voices in Boston, sounded strained at the top of his range. Their theatrical gestures were rather ham-handed. But those were minor blemishes in music of inexhaustible invention and wit. Turner conducted an effervescent performance, the orchestra sounding tight and focused, with superb contributions from the winds.